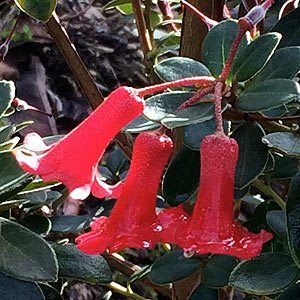 With waxy red bell like flowers, Rhododendron buxifolium is found in Sabah, and surrounding areas. It is another Vireya type, the ‘buxifolium’ name comes from the foliage which is said looks a little like buxus. We think it is much nicer…. Growing in the higher foothill areas such as Mt Kinabalu on the island Of Borneo. The leaves are small and a deep olive green, rounded and slightly felty. The flowers are a brilliant red and highly visible from a distance. Appearing in umbells of up to 10 individual flowers, they are slightly honey scented, however hardly noticeable. In the wild, reaching up to 4m in height, sometimes more. In cultivation much smaller and can be tip pruned to maintain a small bushy habit.